The MPFSC 120-01 filler dispenses cooked rice, cooked pastas (short & long goods), vegetables, and fruits, cereal and seafood such as surimi and shrimp, as well as ready-to-eat salads. The unit has all the features of the original model, but packaged as a single combined unit. The more compact design responds to the needs of food processors with limited space on their production lines. 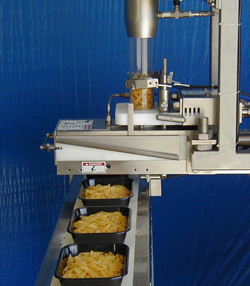 The filler is rated at up to 120 cpm depending upon the product, container or conveyor configuration. It can be positioned over many different container conveying systems, as well as various horizontal and vertical bagging machines. A stainless steel enclosure (IP66-Nema 4x) contains all the electrical and pneumatic components. An Allen Bradley PLC 500 series controls all of the functions of the filler. An AB Panel View 550 displays the operating parameters for easy change. Both have EEPROM memory cards for program backup. A liquid ring vacuum pump, located under the elevator assists in the filling of the product. The product is loaded in the hopper, and a conveyor belt with special finger design takes the product to the filling head. The head is designed with an adjustable volumetric pocket system equipped with either a plate product-separation device, a sharp knife, or a needle assembly, depending on product configuration. The discharge is controlled precisely in synchronization with the container flow, and an advance/retard function keeps the product perfectly positioned in the container at variable line speeds. Cleaning is fast and easy due to the design and small amount of moving parts; tilt-out-hopper, tilt-drip pans, easy disassembly of the head and quick belt release system. A special cleaning mode in the program allows for a quick wash-down of the filler between products, which saves time during product change over. , 4343 West 7800 South, Bldg. B, West Jordan, UT 84044. Tel: 801-280-1570; Fax: 801-280-4341.